So, nothing about hair???......... absolutely..... NOT..... there'd always be something about hair! I noticed while out for retail therapy, a lot of new naturals with "that in between length of hair" where you can't really put it all in a bun and it's too long for a teeny weeny afro. My dears, I've been there twice.... no three times! The first time I was in JS2. I was 13. The original teen right?! That's was the biggest big chop of my life because my hair was healthy, long, full... everything! Anyway, my hair was long one day of school and short the next day! I hated it at first but then loved how it curled up when it was wet and I began to like it. I'd wet it every morning before school,pat it down and leave it to dry without disturbing the curls. 'Young lady, you had better make up your mind. Are you keeping your hair short or are you growing it out long? I was confused. I never thought I had to decide so soon... if at all. I just thought I'd rock it until it was long enough to braid. I told my mum and she was like she since she couldn't find a braider on such short notice, she'd have to cut it low again. When she saw the look on my face, she decided to thread it! I couldn't smile broadly! My mum did her best to "catch" every strand of "in between" hair. First my brother laughed at me, then my sisters, then my dad, then the gateman, then the neighbors and on and on. It drew a lot of laughter (and jokes) from my mates and teachers (even the French teacher). After being thoroughly embarrassed, I finally saw the funny side and laughed at myself (when my hair loosened up a bit).... what else could I do?! So I think I understand how annoying "that in between" stage of natural hair growth after the big chop can be! As I grew older and became responsible for my own big chop and the subsequent "in between" stage, I learnt how to deal with it. Yes, I did it. I hid my "in between" natural hair. I hid it under weaves, I hid it under box braids, I hid it under Ghana weaving. I hid it under wigs. No one except my roommate and sisters knew my hair was short. Please, naturalistas...don't shoot me yet! I didn't have enough info then as I have now. I didn't know I could do coil outs, funky mohawks.... heck... there wasn't any internet then and all the short hairstyles in the magazines were for relaxed hair...so what could I do? The only option then was "didi" aka "hannu biyu" aka "two hands " and I did that a lot too. There's this belief here in Nigeria that it grows out hair. It's a great protective style! The good thing was, I didn't have the opportunity to be frustrated with that "in between length" of natural hair growth and taking down the extensions was as easy as "chop it off to my short length and loosen the rest". Much quicker than if I did it on longer hair. Also I could easily do the "feathered short bob " hairstyle. The bad news was that constantly braiding my hair wrecked havoc on my edges! So my hair grew but my edges didn't. Now I know better to always keep my edges moisturised and protected with a satin scarf at night. Thankfully, I still had my "3 weeks max" rule for extensions. Unfortunately (since I've passed twa stage), I've discovered lots of beautiful styles that work even better on that "in between length" so much so that I've been sorely tempted to chop off my hair again! Do you know that the "in between length" of natural hair is the perfect length to rock a picked out afro without being too "out there" ?! That's why it's the length of most afrocentric weaves sold in the market! - Mini twists and twist outs. The best results are gotten on wet, shrunken hair! Yep, shrinkage is your friend! - Half mast afros. Cornrow, flat twist or band the front (with a cute hair band), fluff out the back and you're good to go! - Fro hawks. You can so get away with frohawks at this length. Longer hair would be too big and may be inappropriate for some places and it doesn't quite look fierce on shorter hair. So never say never with that "in between length" and enjoy it while it lasts because pretty soon you'd have more hair to deal with! Lol! Who knows how many naturalistas you'd inspire....(I may finally chop again) !!!! I can't even remember what I did with my hair at this length. Probably just left it out as a fro. Oh boy! I got so tired just reading this so I can imagine how hectic the week is for you!! Phew!!! But that's the more reason to grab someone and force em to give you a massage.... Hehehe!!! God knws I've bin so frustrated with my "in between" hair nt untill u gave me d idea of twisting wen its wet n later untwisting. 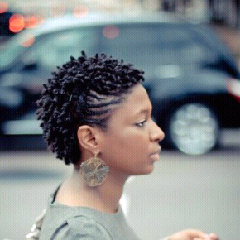 Amma rock deze styles frm nw on! I feel ya but you did a good job with your hair! I'm happy I was able to help.